Now known as Roosevelt Island. In the last quarter of the 19th century Blackwell’s Island was the primary site for government-run hospitals, asylums, and detention centers. Through the 19th century, the island housed several hospitals and a prison. 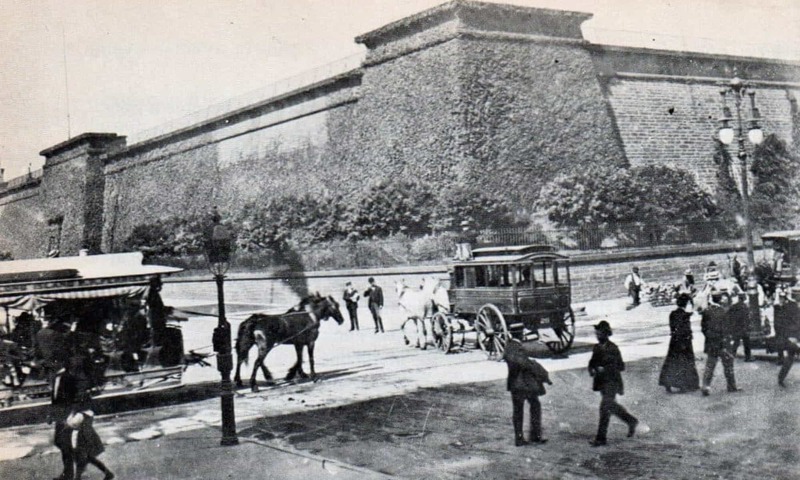 In 1828, the City of New York purchased the island for $32,000 (equal to $687,224 in 2014), and four years later, the city erected a penitentiary on the island; the Penitentiary Hospital was built to serve the needs of the prison inmates. By 1839, the New York City Lunatic Asylum opened, including the Octagon Tower, … The asylum, which was designed by Alexander Jackson Davis, at one point held 1,700 inmates, twice its designed capacity. In 1852, a workhouse was built on the island to hold petty violators in 220 cells. The Smallpox Hospital, designed by James Renwick, Jr., opened in 1856, and two years later, the Asylum burned down and was rebuilt on the same site; Penitentiary Hospital was destroyed in the same fire. In 1861, prisoners completed construction of Renwick’s City Hospital (renamed Charity Hospital in 1870), which served both prisoners and New York City’s poorer population. In 1872, the Blackwell Island Light, a 50-foot (15 m) Gothic style lighthouse later added to the National Register of Historic Places, was built by convict labor on the island’s northern tip under Renwick’s supervision. Seventeen years later, in 1889, the Chapel of the Good Shepherd, designed by Frederick Clarke Withers, opened. Newspaper reports that mention Blackwell’s Island were very common in 1883. So for example from the New York Times. A suit for the annulment of a marriage on grounds of an unusual character is pending in the Court of Common Pleas. The plaintiff is David Boltz. He seeks to be released from his matrimonial relation to Pauline Holtz nee Moses whom he married in April last, and whom he was compelled to have sent to the lunatic asylum on Blackwell’s Island In May. Holtz says that, after a brief acquaintance with Pauline Moses, he became engaged in April 1883, to marry ·her. Her relatives ten told him that it was customary for engaged persons to appear before a City officer at the City Hall and publicly announce their intention to become man and wife. They told him, he says, that this ceremony was not one of marriage, and was in no respect binding on persons of his faith — the Hebrew. He did not wish to marry Pauline until be had learned more about her, and not before his mother should arrive here from Europe. Yet on April 2 he ·went with her to the City Hall were an Alderman performed the ceremony of marriage between them. His lack of knowledge of the English language and his confidence in the alleged statements of Pauline’s relatives kept him ignorant of the fact that the ceremony was not merely one of betrothal. 1t was not followed by cohabitation for be and Pauline continued In the same relation as before it until April 15, when they were married according to the rites of the Hebrew. To the surprise of Holtz, he alleges, his wife became a violent lunatic the day following- their marriage. He appears to have borne with her violence and insane speeches until May 29. when. on the certificates of Drs. W. L. Hardy and M. D. Field, she was committed to the asylum as a sufferer from chronic mania. Since that time, Boltz says he has discovered that his wife’s father. instead of being dead. as he bad been told he was is really an idiot lunatic, and bas been such since 1852. The most remarkable parts of the complaint are as follows: “And plaintiff further shows, upon Information and belief that the defendant has been a lunatic for several years past and has been an inmate of said asylum several times before her said marriage, but that she enjoys lucid intervals, lasting from five days to two months at various times, and that at such intervals she fully remembers all that has transpired before she relapsed into lunacy and that the fact of her being a lunatic is then well known to her, and that she had been advised by her physician that, in the event of her becoming a married woman, her said lunacy may probably cease, and, cured thereof altogether. That on or about the first day of April 1883, when plaintiff first made her acquaintance, up to and including the said 15th day of April 1883, the defendant had been enjoying such a lucid interval, and during all this time she acted like a sane person, and, in fact, was sane and enjoying all the mental faculties of other sane and rational persons, and the fact of her ever having been insane or of unsound mind was entirely unknown to the plaintiff, nor was he ever informed thereof until the said 16th day of April 1883 when, for the first time, he became apprised of the ethe real condition of defendant’s mind, as aforesaid, and then only he learned the facts hereinbefore stated. Plaintiff further alleges that the defendant and her relatives well knowing the premises wrongfully and maliciously withheld the facts above stated form this plaintiff, with the fraudulent intent to induce him to consent to marry the defendant, and thus make him the tool or instrument of her very improbable recovery from said lunacy, in utter disregard of his own personal happiness and of the direful consequences in case of issue of the marriage, for generations to come, more especially as defendant’s father is also a lunatic, as plaintiff is informed and believes.” … As Dr. T.M. Franklin, the Superintendent of the asylum, refused to allow the summons to be served personally on Mrs. Holtz, because he feared it would have a bad effect on her, Judge J.F. Daly, in Common Pleas Chambers yesterday granted an order for the service on the doctor as her temporary guardian and on her mother. Mrs. Holtz is only 20 years of age.